It isn’t Derby Season without some Pappy Van Winkle! 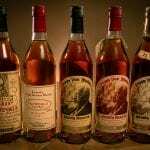 Cox’s wants to give you 5 bottles of Pappy and help out a great organization in the process. Starting Thursday April 4th stop by any Cox’s location or Evergreen Liquors to purchase $10.00 raffle tickets. Tickets can be purchased through May 2nd and on Oaks day we will draw 1 lucky ticket! The winner will walk away with a bottle of 10yr, 12yr, 15yr, 20yr, and 23yr Van Winkle! All Proceeds from the raffle will go directly to the Kentucky School for the Blind Charitable Foundation!